"This is the afternoon nap. 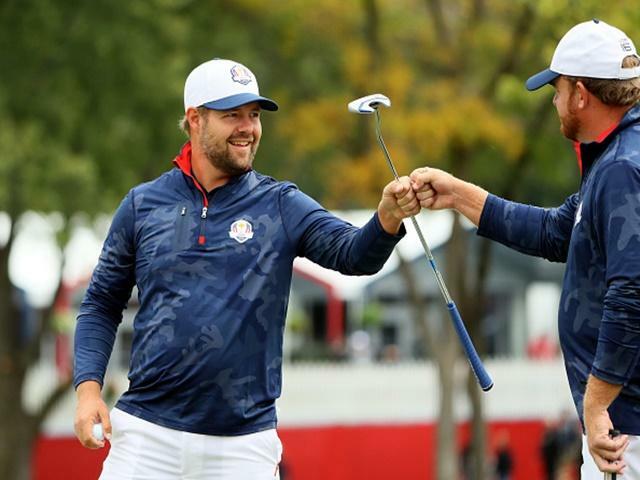 I expect both Holmes and Moore to thrive in this Ryder Cup and they should make for a well-matched pair." Having led the way this morning with a stunning performance, Team USA's star pairing open the afternoon proceedings against the same, all-star European pair. Though it didn't work this morning, I'm happy to stick with a similar strategy, albeit setting the lay target at a slightly lower mark. All four of these players are of the very highest class, with pedigree in both strokeplay and matchplay. Trying to manufacture an argument against one or the other is a questionable strategy. There will be halves during this Ryder Cup, and many more matches going down the 17th and 18th, at which stage the tie is highly likely to trade below [3.0]. This fourball looks ripe for such a close outcome. Indeed the back to lay plan probably works better in fourballs, because holes are much likelier to be tied. Therefore, if the sides are separated by no more than a single point down the back nine, there is a massive chance of getting matched. This is the afternoon nap. I expect both Holmes and Moore to thrive in this Ryder Cup and they should make for a well-matched pair. Holmes hits it a mile and could destroy the par-fives. Moore is superb around the greens. Having sat out the morning rout, they should be raring to go. Garcia was very disappointing this morning, and historically less effective in this format. I though he'd be asked to coax Cabrera-Bello through foursomes, as his compatriot looked better suited to that. With his team now 4-0 down, the pressure is truly on the debutant. Talking of pressure, Danny Willett could be forgiven for dreading this afternoon after his well-documented terrible week. A well lubricated crowd will be on his case for sure. However we shouldn't doubt the temparement of a Masters champion and their opponents aren't the strongest pairing. For the reasons laid out for the top match, I'm trying that back to lay strategy again. I think this one will be close, offering plenty of trading mileage. Given how well they both played this morning, this USA dream-team must be persevered with. I can see DJ and Kooch playing all four pairs matches together. In another scenario, I could see McIlroy and Pieters making a good fourball team. They both hit it miles and makes stacks of birdies. However this is a tough ask and Pieters in particular didn't enjoy a great morning.